Forman Folk, our traditional music group, will meet on Wednesday 25th November from 7:00 to 9:00pm with a tea or coffee break during the evening. 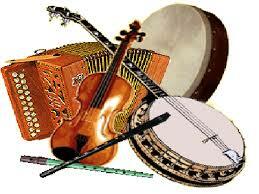 Everyone is welcome to bring along their chosen musical instrument - including voice. The only charge is a donation towards the hire of the small Hall. Contact Donald on 880256 for any more information. The CDT is part of a consortium of valleys who are going through a long-winded process to apply for some of the Scottish Government's £40million fund to improve rural broadband. Thank you to everyone who filled in the Broadband Survey and special thanks to the directors of the CDT who attempted to visit every house in the valley. Although exact figures have not yet been released, by my estimates we had nearly 60% of valley properties fill in the questionnaire. Apparently, that's quite a good survey return rate. The sale of the Valley Calendars has been a great success. Thanks go to the photographers who submitted such great photographs, everyone who has purchased a calendar and the Directors of the CDT who helped sell them. All the proceeds go to support the CDT. 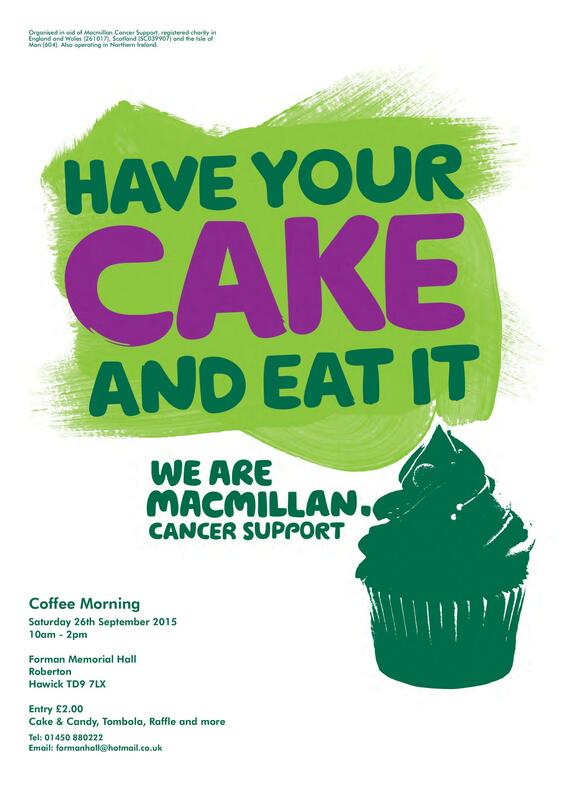 We are holding a Macmillan Coffee Morning on Saturday 26th September from 10am in the Forman Hall. Entry is just £2.00 for a cuppa and scone. Home baking will be on sale as well as tombola, raffle and lots more. Please come along and support a great cause. The Gardener's Forum are once again organising the harvest supper which will be held in the Forman Hall on Sunday 4th October at 7.00 p.m. following the Harvest Thanksgiving Service in the Kirk at 6.00 p.m. to which all are welcome. We shall be serving Sausages Braised in Red Wine with mashed potato, carrots and broccoli followed by Eve's Pudding and custard. The cost will be £6 per head. As usual please bring your own drink as we shall be providing water only. This year's competition is "Colour in My Garden" to be presented in a 1lb jam jar and is open to all. The harvest supper is a lively and informal evening and you will be made very welcome. If you would like to attend please contact Colin Plumbe on 01450 880266 by the 29th September to book your place. The Met Office have issued a Severe Weather Warning 'Yellow Warning' for rain and thunderstorms for the Scottish Borders area, in conjunction with this SEPA have also issued a general flood warning for the Scottish Borders. This weather front is currently causing considerable problems in the south of England and as it moves north the hope is that it will lessen in strength, but we are expected to receive a considerable amount of rainfall, some areas may escape this, but in general the warning is for the whole of the Scottish Borders. The Council have carried out checks on watercourses and grilles to ensure they are clear, and sandbags can be obtained from your local fire station, or Resilient Communities sandbag store. Our popular mind and body workout class will continue on Thursday 22 October beginning at 6:45. At 8:00 we share refreshments and chat! Loose, comfy clothing is best and bring a yoga mat if you have one. The cost remains at £5.00 per class. Good luck with your Salutations to the Sun, everyone. Contact 880256 for more information. 11 valleys are getting together to sort out the poor internet for themselves. The Borthwick Water Valley is one of them ! We need your help. It takes less than 5 minutes of your time (the irony being "internet permitting"). Here's the long story, shortened. The Scottish Government have a pool of £40 million to sort out rural broadband issues. It's up to organisations to apply for funding to provide better internet for their communities. We have joined forces with Ettrick and Yarrow, Upper Teviotdale, Tweedsmuir, Moffat Water, Lilliesleaf, Ashkirk & Midlem, Glen, Orchard Mains & Traquair and Eskdalemuir to apply funding to improve our broadband. More Valleys EQUALS bigger (and therefore more attractive) projects for companies to tender for. Residents of the Borthwick Water Valley may have noticed the big yellow sign advising of road closures on August 9th. The event website is http://tourotheborders.com/community and it advises that the road closures are well down the B711, and won't affect the Borthwick Water Valley roads themselves. A big shout of thanks goes out to everyone who submitted photographs for the Valley Calendar. We had some amazing photos and we feel they've made a great calendar. Photos of the Borthwick Water Valley by people who stay/live in the valley ! 60 Photographs were submitted in total from 11 valley residents and the CDT Directors had quite a challenge picking the final 13 (12 + frontpage) ! We are only having a limited print run of 150, and before we have even received the final hard copies, we have taken orders for 36. So if you would like one or more, please get in touch as soon as possible. They cost £5 and the profits help support the CDT. If there are any left, they will be going on sale at The Roberton Show in the Valley Wares Tent.